Forum member TzuDohNihm alerted us to something so aggressively adorable, it bears mentioning. 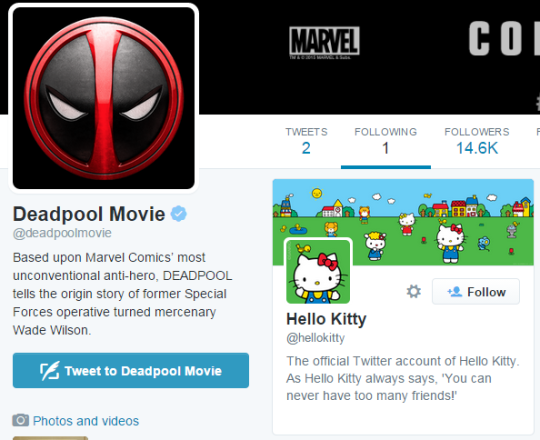 The official Twitter account for Deadpool is only interested in seeing the tweets of one particular account. Who might that be? I have no attachment to the character of Deadpool, but goddamn is this movie making me a fan based solely on its attitude and sense of fun. I think I’m going to have to do some catch-up reading before the film comes out next February. Does anyone have any recommendations for some essential Deadpool stuff? If it doesn’t involve the bulbous monstrosities that Rob Liefeld passes off as art, I’ll be much more interested. Leave your recommendations in the comments.